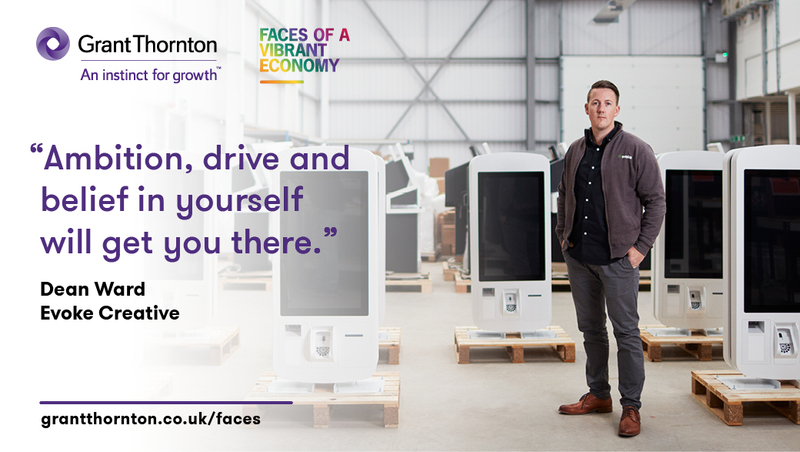 Grant Thornton unveils 2018 Faces of a Vibrant Economy and our Co-Founder and CTO is one of them! Evoke Creative has gone from strength to strength in recent years, and we celebrate our successes at every opportunity. This year we’ve expanded into our new HQ, taken our staff numbers up to 75 and scored a number of new client wins along with helping our existing customers to continued success and growth. Our amazing team have raised over £6000 for our charity of the year and we’ve had more evoke social days than ever. None of this would be possible without the vision and dedication of our co-founders Neil and Dean. Tirelessly overseeing every detail of our HQ design and fit out, investing in our management team and staff development and making firm plans for future success, the dynamic duo are the beating heart of Evoke. It’s exciting this week then to reveal that CTO Dean has been chosen as one of Grant Thornton’s 2018 Faces of a Vibrant Economy. Dean has had a busy year working with our Technical and Design teams, adding a full software team and ensuring evoke remain at the forefront of innovation. Dean has also found the time to participate in a number of our charity initiatives including the Wirral 10k and Hell Runner North to raise money for Claire House Children’s Hospice. In 2018 Dean has also forged new relationships with local partners including Liverpool LEP, All About STEM, Wirral STEM Partnership for Girls and universities in Liverpool and Staffordshire. Managing the skills gap is a personal passion of Dean’s, recognising that investing in the next generation of tech and design staff makes good business sense but also benefits the local and national economy. Congratulations Dean for making it onto this year’s list! Read more about Grant Thornton’s Faces of a Vibrant Economy.